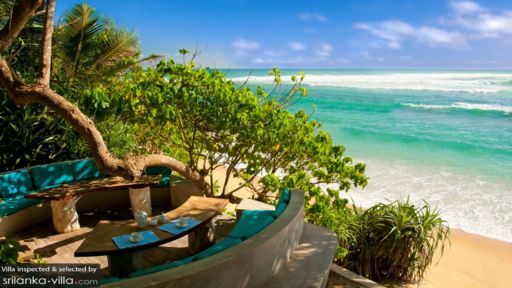 Walauwa, is the Sri Lankan term of a stately home, and Villa Walauwa definitely meets the criteria of a Walauwa. 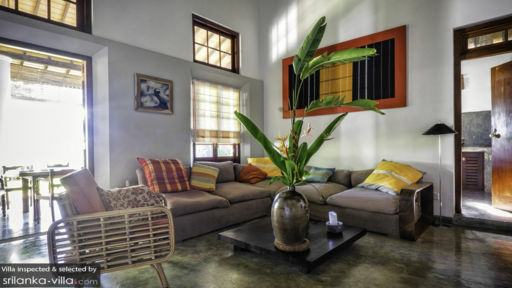 This two bedroom colonial style Villa decorated with local antiques creates a stately and luxurious ambiance. The two bedrooms with traditional four poster beds and antique furniture, decorated with all sorts of hand-picked pieces of Asian art, it might be difficult to drag yourself away. While the veranda in front of Villa Walauwa is perfect for enjoying the garden, as well as views of the Indian Ocean. Guests who prefer to get into the ocean just have a walk a few steps down to the beach. The colourfully decorated Villa Walauwa has both indoor and outdoor living areas with a living room equipped with a large comfortable sofa in front a wide screen LED TV, ideal for just lying back and relaxing in front of a good movie. 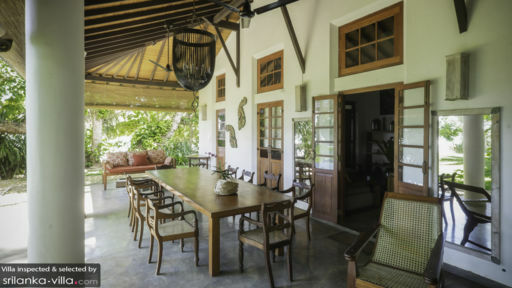 For both who would rather look at the lush tropical garden around Villa Walauwa and try some bird watching, there is a big veranda in front of the Villa with a eight seater table which is perfect for a large family meal. Villa Walauwa is equipped with a fully functioning kitchen, but if you want to be pampered, then that’s not a problem because as a part of the Earaliya Villas and Gardens, you will find that luxury is not something that is done imperfectly. Comfort is the key word for the staff at Villa Walauwa and they will do provide you with all the requisite services and amenities to make your stay as comfortable as possible. Villa Walauwa is located in Weligama a small fishing village in the south coast of Sri Lanka, famous for its surfing friendly waves. Being only about 45 minutes of the UNESCO World Heritage site of Galle and the national wildlife park of Yala, there are plenty of things to do and see around the area.